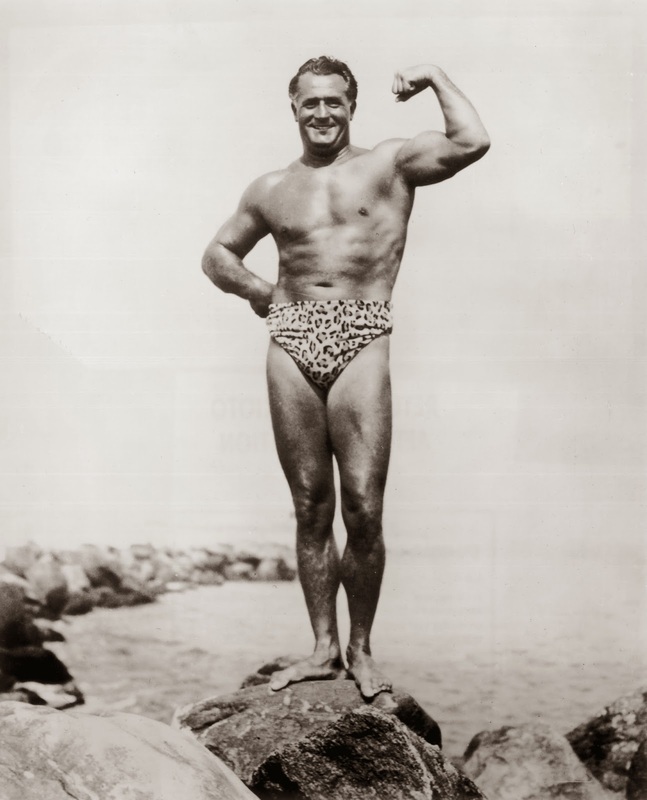 Today would be bodybuilder Charles Atlas's 121st birthday were he still with us (he died in 1972). Though best known for his Dynamic Tension exercise program that could turn a 97-pound weakling into the hero of the beach, Atlas also earned extra cash by posing as an artist's model. By some counts, over a hundred sculptures and paintings feature Atlas, many of them pieces that New Yorkers pass every day. Born Angelo Siciliano on October 30, 1892, Atlas moved to Brooklyn in 1905. One day when he was a skinny 15-year-old, he was lounging at Coney Island when a bully came up and kicked sand in his face. Vowing never to be so humiliated again -- and supposedly inspired by a statue of Hercules at the Brooklyn Museum -- Atlas began strength training. By the time he was nineteen, he was employed as a Coney Island strongman; in 1922, he legally changed his name, and in 1929 he launched his mail-order fitness program, known to comic-book readers for generations. Before Atlas hit it big, he also made money posing as a studio model. No definitive list exists of what pieces were based on Atlas's physique, but the ones below are usually associated with him. 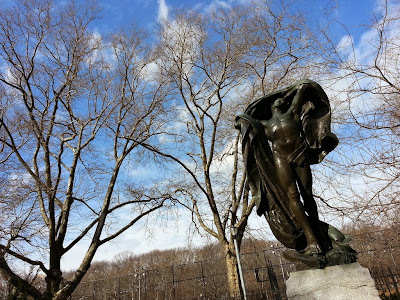 Among Atlas's most dramatic poses is the allegorical "Dawn of Glory" in Highland Park in Brooklyn. 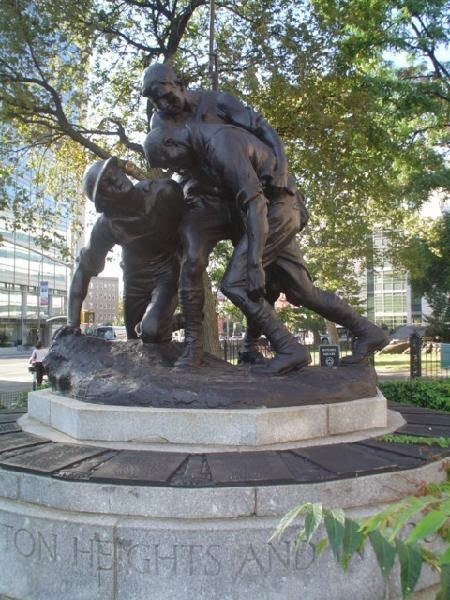 This 1924 statue by Pietro Montana was dedicated to the men who died in World War I who hailed from the Highland Park and East New York neighborhoods. As the Highland Park website notes, the "sculpture depicts a male with face turned skyward in the process of disrobing, giving the illusion that the statue is unveiling itself. 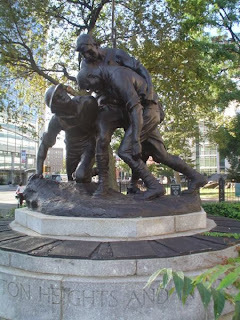 It is the physical embodiment of the spirit of those who served, and the glory in the hereafter." According to a 1942 New Yorker profile of Atlas (paywalled), it was Gertrude Vanderbilt Whitney who gave the bodybuilder his start as a model. Whitney was "working on a group for a soldiers' memorial" and in need of a "husky model." 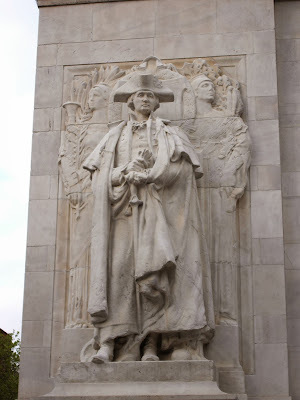 The article doesn't say what piece she was working on, but there's a good chance it is the memorial in Mitchel Park in Washington Heights, another local tribute to those who died in the First World War. We've written about Frederick MacMonnies's "Civic Virtue" before -- it stood in front of New York's City Hall until Mayor Fiorello LaGuardia had it unceremoniously removed to Queens, where it resided until December 2012. It has now been moved to Green-Wood Cemetery in Brooklyn. 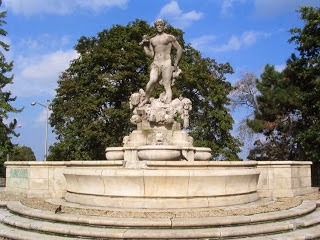 The "Rough Guy" (as the figure of Civic Virtue was nicknamed) is modeled on Atlas and has been deteriorating for years. There's no word, yet, on plans to restore the piece. This last one isn't in New York, but is probably the most famous of all of Atlas's modeling work. Commissioned in 1920, this statue by James Earle Fraser stands in front of the U.S. Treasury Department and shows America's first treasury secretary, Alexander Hamilton, his chest puffed out -- it almost looks like he's ready to strip off his clothes and show off his Dynamic Tension physique. 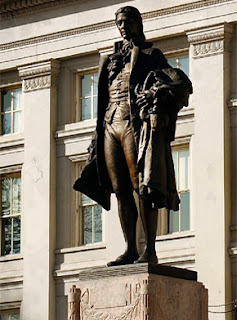 Hamilton certainly looks more robust here than the "little man" that John Adams once described him as being. pre-order it if you are so inclined at Amazon.com.